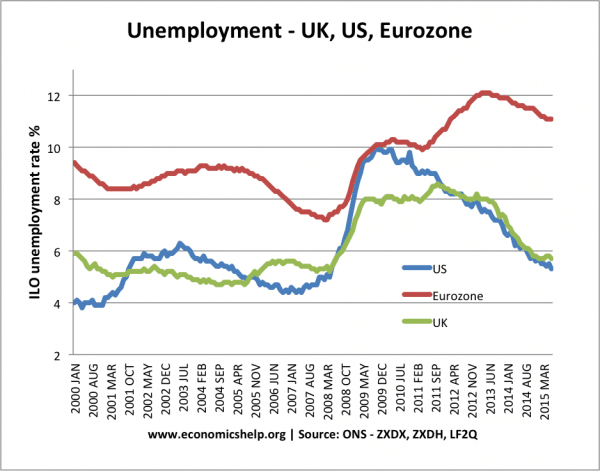 Home > Economics help blog > unemployment > Does Fiscal Policy solve unemployment? Readers Question: Is the fiscal policy effective/the best policy to deal with unemployment? It is an interesting question and one that is likely to generate different views from within the ranks of economists. Keynesians say yes, fiscal policy can be effective in reducing unemployment. In a recession, expansionary fiscal policy will increase Aggregate Demand (AD), causing higher output, leading to the creation of more jobs. In a recession, we see a rise in unemployment as firms lay off workers. In response to the recession, there is a rise in personal savings as firms cut back on investment and households cut back on consumer spending. This reduction in spending causes a negative multiplier effect and magnifies the initial fall in unemployment. This leads to a negative output gap, with unemployed resources. In this situation, the government can usually borrow from the private sector at a relatively low cost of borrowing. The government can spend money on infrastructure projects. This injects money and spending into the circular flow – causing a rise in aggregate demand. Fiscal policy (cutting taxes and/or increasing spending) can lead to an increase in AD and rise in real GDP. The increase in economic growth will cause increased demand for workers, providing employment and reducing unemployment. If there is frictional or structural unemployment, fiscal policy will not solve this. For example, suppose some former miners are unemployed. The problem here is lack of skills and geographical immobilities. Therefore, what is needed is supply-side policies. Increasing AD and economic growth does not solve the mismatch of skills. Therefore, when the economy is at full capacity, classical economists are correct. If the economy is growing and the government pursue fiscal policy, it is likely to be ineffective in reducing unemployment. At close to full employment, higher government borrowing will cause crowding out (government borrowing reduces the size of the private sector and reduces private sector investment). Also, with a growing economy, higher government borrowing may push up bond yields and higher interest rates may reduce private sector investment. Also, if the economy is at full employment, and the government pursue expansionary fiscal policy, we will see higher inflation. Tax cuts may be saved not spent. In a deep recession, consumers may be reluctant to spend – even if you cut taxes. It may also depend on which taxes you cut. Low-income workers have a higher marginal propensity to consume. Therefore, cutting taxes will have a bigger effect on improving spending. Time Lags. Fiscal policy can take time to implement. The government have to decide which projects to follow, and there will be time before the project gets off the ground. However, despite these limitations, it can play a role in increasing AD and reducing cyclical unemployment. In February 2009, Congress approved President Obama’s $787 billion American Recovery and Reinvestment Act. This was a package of tax cuts and spending increases – financed by higher borrowing. It involved tax cuts of $288 billion. Extended unemployment benefits of $213 and $275 billion in federal contracts, grants, and loans. The package wasn’t implemented immediately and took several months for the higher spending to be spread throughout the economy. The government also approved a bailout of the automobile industry which helped avoid job losses in that sector. Given the time lags involved, the package was successful in limiting the scope of the 2009 recession and creating an economic recovery. As a result of the economic recovery, unemployment fell at the end of 2009 and consistently fell into 2017. Strong recovery in the US. 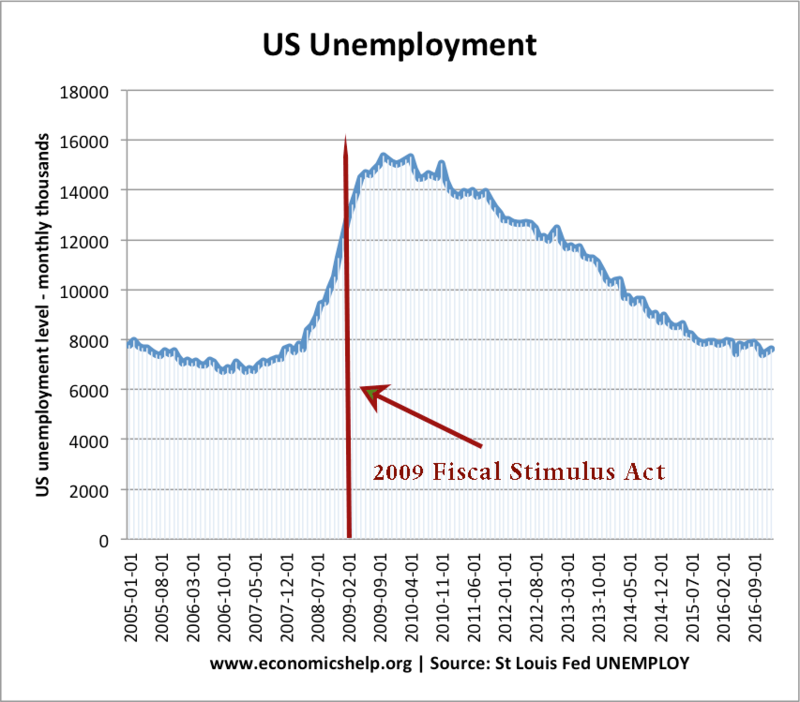 The fall in unemployment wasn’t just due to this expansionary fiscal policy. At the same time, there was also a loosening of monetary policy – with interest rates cut to 0.5% and a policy of quantitative easing. This monetary easing also contributed to the economic recovery. Also, the natural economic cycle is for the economy to recover after a period of economic downturn. Some economists, such as Paul Krugman argued that the expansionary fiscal policy was insufficient and only a small % of the US economy. 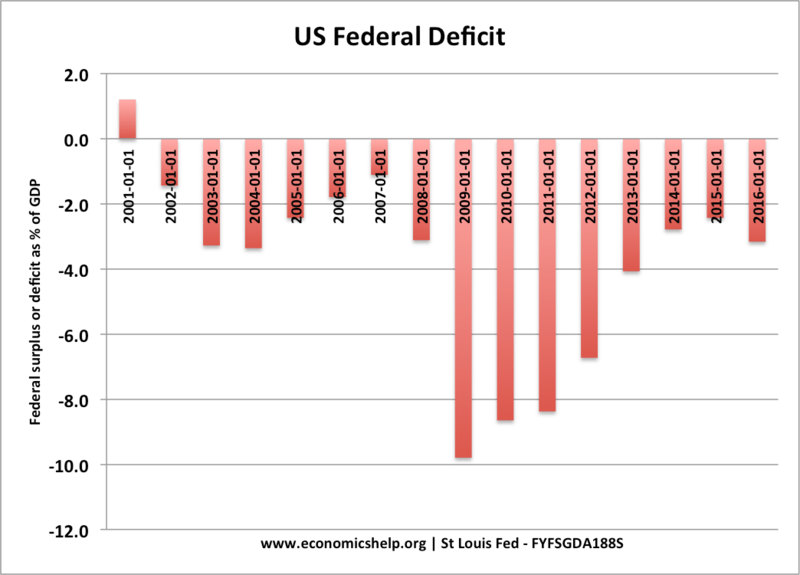 A bigger fiscal package would have enabled a stronger recovery. 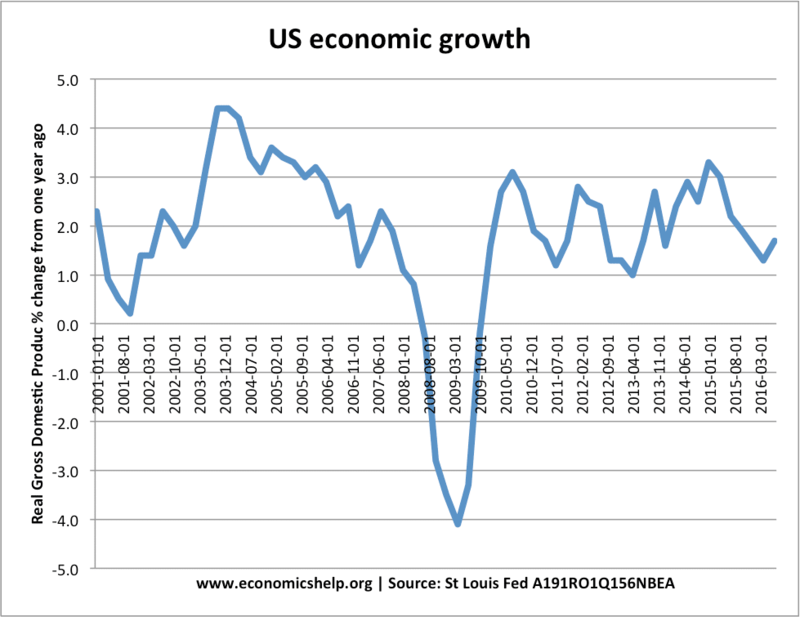 However, compared to the Eurozone – which didn’t pursue expansionary fiscal policy, the US recovery was stronger. Also, some economist such as John Taylor of Stanford, and Eugene Fama of the University of Chicago were more suspicious of fiscal policy arguing it leads to higher borrowing costs, crowding out and just ends up with higher government borrowing. 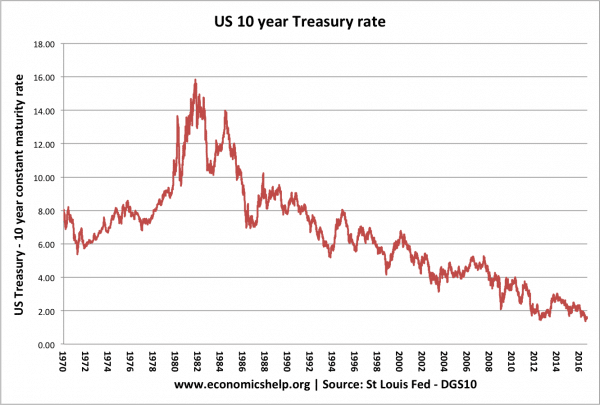 However, despite the rise in US borrowing, bond yields fell during this periods, and the budget deficit fell with the economic recovery. Higher debt did not cause higher bond yields but falling bond yields, suggesting there was strong demand for buying government debt. Can UK and US prevent a Recession? in the modern society and current economic situation there is no room for classic economists and therefore it is neccessary to take the optimistical view that FP does reduce unemployment no matter how theoretical that answer is. what impact or effect does fiscal expansionary policy have on the fishing sector? Use of fiscal policy to solve unemployment problem in countries like India requires a different kind of treatment in the sense that the quality of money spent by the government is important. The quantity or size and no of spending programes have increased but they have not reached the people who deserve it. A holistic approach of socio-political implications and involvement along with economic implications of fiscal policy become essential. Along with the national the subnational finances play critical role in doing so. from my point of view, i believe fiscal policy can reduce unemployment conversely, it also has its bad sides which sometimes overshadow its usefulness in solving unemployment. its looks like that it reduce unemployment if we look on Keynesian grafs . 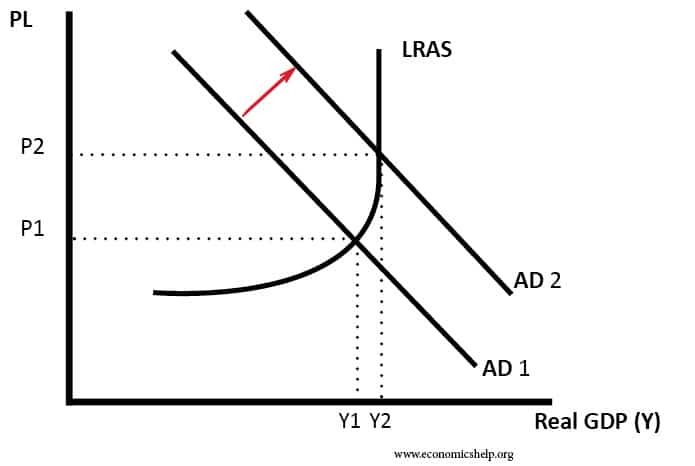 but when ad curve increases the effect on wages will increase which give the feed back to increase in money demand consequently increase in the rate of interest which will hurt the future investment and unemployment increases by the fiscal policy . 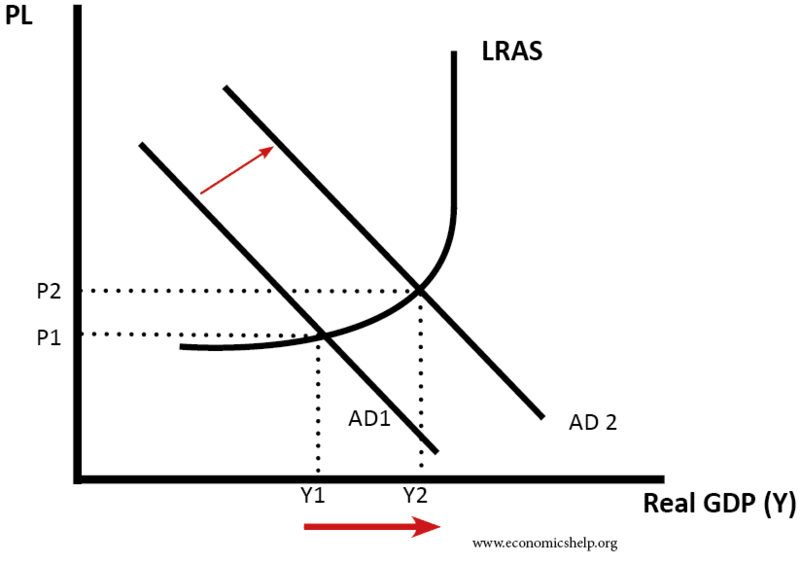 monetary policy has always win win situation , by increasing supply of money rate of interest will reduces and feed back of this it increases investment (if there is not liquidity trap) and consequence will be generation of employment.